The temperatures have hit frost twice and freezing once now. I took some time a couple of weeks ago to tuck the Victory Garden in for the winter. After pulling out the last of the kale plants and tomatoes, I emptied and carried in the rain barrel and spread the compost bin over the whole thing. The trees cooperated and kindly dropped their leaves on top. Nice and snug. 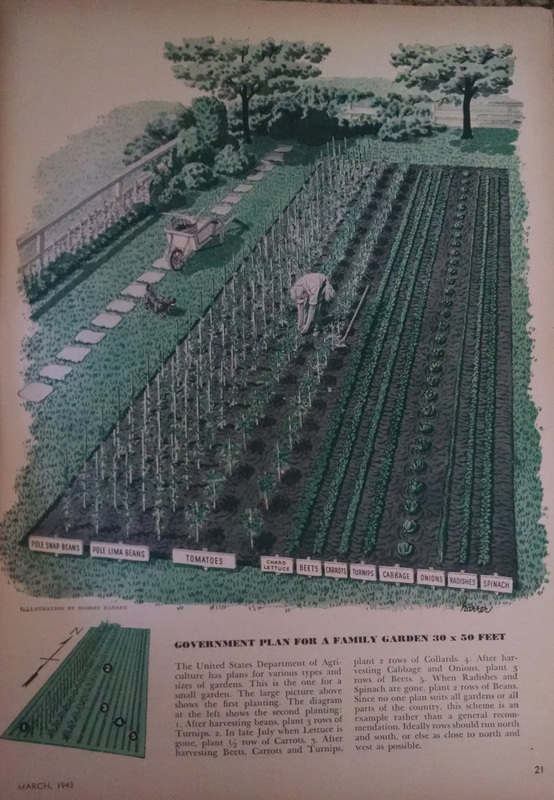 It wasn’t until very recently when I stumbled upon a March, 1943 Woman’s Day magazine at a used book sale that I realized the correct measurements of a true Victory Garden. 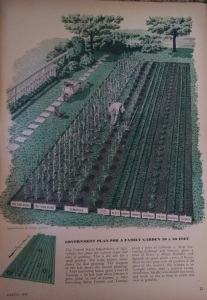 The interview with an Office of Information US Department of Agriculture spelled it out clear — 30 x 50 feet for a small garden, done in two plantings. Pole Snap Beans, Pole Lima Beans, Tomatoes, Chard Lettuce, Beets, Carrots, Turnips, Cabbage, Onions, Radishes, and Spinach in the spring. After harvesting beans, plant three rows of turnips. In late July when lettuce is gone, plant 1/2 row of carrots. After harvesting beets, carrots and turnips, plant two rows of Collards. After harvesting cabbage and onions, plant three rows of beets. When radishes and spinach are gone, plant two rows of beans. Ideally rows should run north to south. Did you catch that — ‘small garden’? My garden measured 30 x 10 feet. And that was a double in size from before the War In My Kitchen project began. I didn’t come nearly as close to the variety of plantings the government requested of me (Peas, Beans, Tomatoes, Kale, Lettuce, Beets, Pumpkins, Potatoes, Cucumbers, Dill). There’s always next year…which is what us gardeners start to think about on the first snowy days in January. Americans did their part to follow the recommendations of the government. 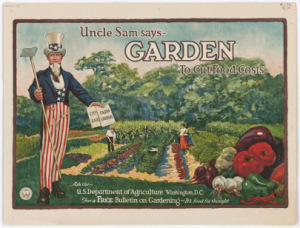 20 Million Victory Gardens were planted during the war years, accounting for 30%-40% of the demand for vegetables, nearly 10 million tons all planted and harvested by hand, prepped by women in their war kitchens. 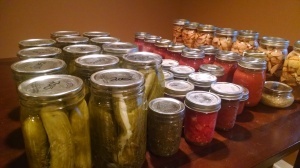 From my garden to the canning shelf in my basement, I have preserved Dill Pickles, Pickle Relish, Salsa, V-8 Juice, Spaghetti Sauce, Diced Tomatoes, Apple Pie filling, Applesauce and even a little horseradish (a little goes a long way!). History shows that we were more than willing to turn the farming back over to the farmers at the end of the war. 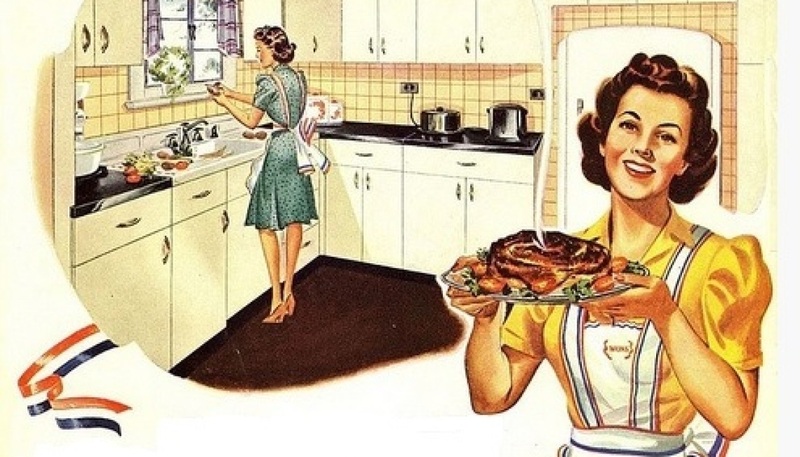 Food shortages remained in 1946 because people stopped gardening and turned to grocery stores. Agriculture was adjusting planting and harvesting techniques learned during the war years and transportation from farm to store were lagging. Boom time was coming and freedom from want was ending, but we had to readjust our planning and producing towards for our own first. Times were changing.